In mid-September, Baptist Health Care launched the Nursing Honor Guard, a new program established to honor and recognize men and women at the time of their death who dedicated their professional lives to the practice of nursing. About a dozen current and retired nurses volunteer their time as members of the Nursing Honor Guard, attending the funerals of former Baptist Health Care nurses in Escambia and Santa Rosa counties within a 50-mile radius of Baptist Hospital. The honor guard is invited by the families, and its participation in each service depends on the individual family’s request. 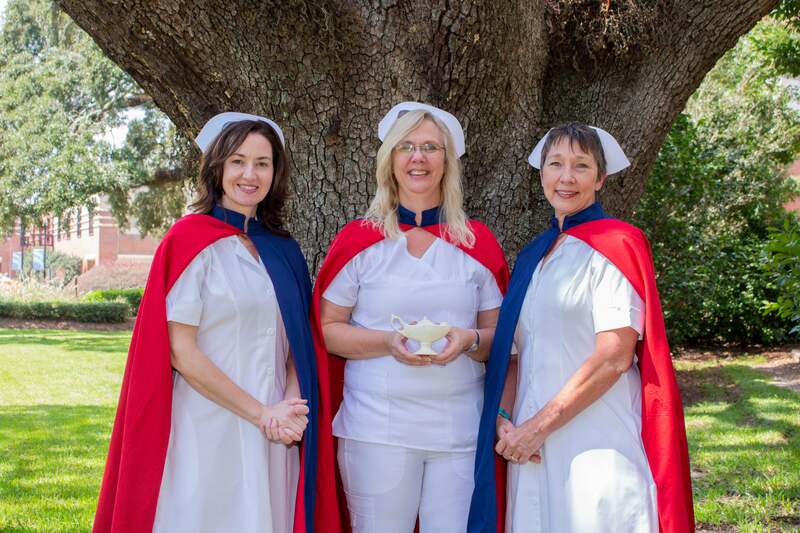 Nursing Honor Guard members dress in traditional white nursing uniforms, white caps and blue capes, and carry Victorian-style lanterns to represent Florence Nightingale, the founder of modern nursing. The capes were made and donated by Theresa Lee, RN, who is a clinical educator at Baptist’s Gulf Breeze Hospital. The uniforms and caps were donated by Uniformly Yours, a local medical uniform store. Families of Baptist nurses who would like to invite the Nursing Honor Guard to be a part of their loved ones’ memorial services can email their request to BHCNurseHonorGuard@bhcpns.org.